Understanding Spectrum Clutter—It’s Not About Neatness! Home > Understanding Spectrum Clutter—It’s Not About Neatness! Merriam-Webster defines clutter first as “a crowded or confused mass or collection,” and then as “interfering radar echoes caused by reflection from objects (as on the ground) other than the target.” As we work to make the most efficient use of the radio spectrum, including by sharing it, we need to better understand how radio spectrum interacts with real world environments, not just in a lab, in order to predict when and where interference might occur. Imagine painting rings around a particular source showing how far out the signal is likely to travel and cause possible interference to other sources – the better our understanding of how the spectrum operates in various environments the narrower the “brush” we can use to paint those lines. This means there will be less geography that must be protected against possible interference. One key issue that needs to be studied in more detail is “clutter,” which consists of environmental features such as buildings, other structures, and vegetation that cause signal loss due to scattering and absorption. NTIA’s Institute for Telecommunication Sciences (ITS)  has been working to better understand how to factor in clutter when analyzing and predicting the behavior of radio waves. ITS engineer Chriss Hammerschmidt presented a paper earlier this week on “Extracting Clutter Metrics From Mobile Propagation Measurements in the 1755-1780 MHz Band ” at MILCOM 2016 , an international conference for military communications. The paper describes spectrum measurements ITS took during 2015 to inform and validate new radio wave propagation prediction models. Propagation models, mathematical algorithms that predict the behavior of radio waves, are an essential enabler for spectrum sharing. ITS and its predecessor labs within the Department of Commerce have been developing and improving propagation models since about 1909. But increased demand for spectrum, advances in technology, and the tremendous increase in the everyday spectrum usage (sometimes referred to as the “noise floor”), means that there are tremendous potential benefits from more research and testing to improve the accuracy of existing propagation models. 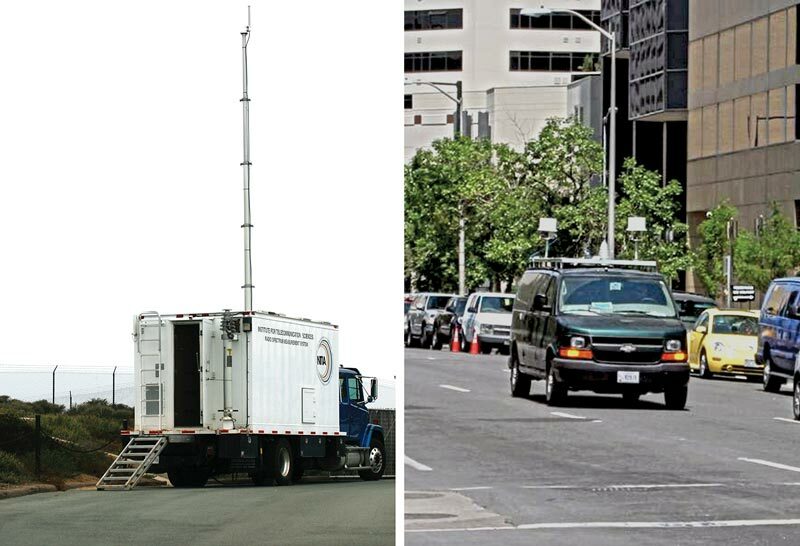 In 2012, Commerce Spectrum Management Advisory Committee (CSMAC) working groups explored ways to cost-effectively facilitate the implementation of commercial wireless broadband in the 1695-1710 MHz and 1755-1850 MHz bands while protecting existing federal operations. Their work relied heavily on propagation models to predict interference or non-interference between disparate communications systems operating in the same or adjacent frequency bands. Their recommendations cleared the way for the Federal Communications Commission (FCC) to auction Advanced Wireless Service (AWS) licenses in the 1695-1710 MHz, 1755-1780 MHz, and 2155-2180 MHz bands (the AWS-3 bands )—an auction that raised nearly $45 billion in gross revenues. While most of the federal systems operating in those bands will be relocated, a limited number of federal systems that cannot easily be relocated will remain in the bands indefinitely, sharing the spectrum with non-federal users. The FCC designated “protection zones” around federal systems that will share spectrum with the new AWS systems. Within these zones federal and non-federal users will have to coordinate operations to mitigate interference. To do this, they will need to be able to predict the coverage area and signal strength of the various types of transmissions sharing the spectrum. The final CSMAC Working Group 5 report  on AWS-3 sharing noted that clutter and terrain effects were not considered in any of its baseline interference analyses because agreement was not reached on how to do so. CSMAC issued a strong recommendation for additional study of the impact that clutter and terrain have on propagation. If agreement among stakeholders could be reached on a sound methodology to add the impact of clutter and terrain into existing propagation models, it’s highly likely that protection zones could be reduced and commercial users could gain expanded access to spectrum shared with federal incumbents. As computing equipment has become more powerful, more data and more parameters can be included in propagation models. To validate the accuracy and reliability of these refined models, their predictions must be compared to a reliable body of measured data. ITS has been working with the National Institute of Standards and Technology and the Defense Spectrum Organization to take propagation measurements in various locations representative of sites under consideration for federal/non-federal coordination to inform a clutter loss model. Measurements taken by ITS in late 2015 will be used to develop a validated, trusted clutter loss model for use by all stakeholders in a sharing scenario. As the telecommunications industry moves into the future with new technologies like 5G, ever more detailed models of clutter loss will be required to facilitate spectrum sharing. This set of measurements is a first step on the path to making spectrum sharing as efficient as possible. Tremendous opportunities remain, however, for investment in propagation research and testing to achieve even greater efficiencies in our use of limited spectrum resources.